In The Toorak Jackpot, debut author Rosemary Macindoe concocts a breezy send-up of chasing wealth Down Under. Bert begins living the high life and, according to a condition of the gift, introduces himself as royalty to his amused neighbors. Rejecting the advice of his broker, he invests in Bogus Minerals. When Bogus goes bust, Bert becomes broke. En route from prince to pauper, Bert decides to find work and live within his means. Upon giving 20 cents to a grateful street musician, he discovers an important life lesson. 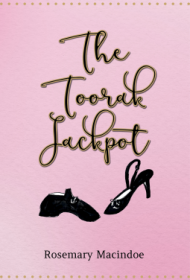 A swift read, The Toorak Jackpot humorously looks at what it means to be truly fortunate. Echoing the good deed of her character, Macindoe states that 20 cents (AUD) from the sale of each book will be donated to the Clown Doctors, the Humour Foundation, an Australian charity.